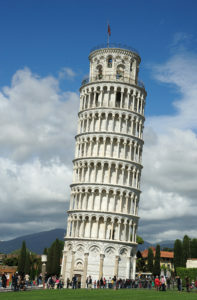 Construction work completed in 2001 is having an unexpected effect on the Leaning Tower of Pisa: Since then, its tilt has lessened by 1.5 inches. The tower was closed to visitors from 1990 to 2001 while construction work was done to correct the tilt and protect its long-term stability. When it reopened, it had straightened by 15.95 inches, returning its slant to the degree it had in 1820; the 1.5 inches it has straightened recently is on top of that number. Nunziante Squeglia, a University of Pisa engineering professor and a consultant on the committee that oversees the tower, said the tower “is continuing to straighten” despite the fact that experts did not believe it would. The 190-feet-tall Leaning Tower of Pisa was built in 1173 as a bell tower for the Pisa cathedral and baptistery. It began sinking into the ground five years after that, and was completed 200 years later. Construction workers tried to straighten it while they were building it, but failed. The tower receives about 3 million visitors per year, along with the adjacent cathedral and baptistery. Recently, officials halved the number of people allowed to climb it – to 400,000 – due to concerns around the effect of large numbers of people on the tower’s stability. Though the monument’s stability is still precarious, Salvatore Settis, a member of the committee that oversaw the construction work, called the tower’s current state “very good.” Settis is now on a committee that monitors the tower, relying on more than 100 sensors to give hourly updates on factors such as external and internal temperatures, soil movements, wind, and microfissures in its building materials. However, this doesn’t mean the iconic Leaning Tower will lose the “Leaning” part of its name anytime soon. According to Squeglia, the tower would take 4,000 years to fully straighten.